Testers wrote that the inner sleeve didn’t rub against their skin, thus giving them irritation-free running experiences. The breathable upper was lauded by many because it allowed air to keep their feet ventilated easily. The thick midsole unit of the Clifton 3 was a hit for runners because it was able to deliver maximum underfoot comfort. Users also felt that the robust mid-sole was able to attenuate the landing impacts efficiently, which was helpful. The curved arch was able to keep the mid-foot area well-supported, and it gave many of the testers the incentive to run farther with sureness and ease. One of the ‘pros’ listed for this running shoe was that it delivered good traction on the surfaces. The majority of those who tried the Hoka One One Clifton 3 appreciated its lightweight nature. An issue was raised about its sizing scheme, which some thought was a ½ size smaller than what they were used to. A few testers noted that the outsole unit’s rubber layer wore out quickly. The Clifton 3 from Hoka One One gained positive feedback from a lot of runners who thought that it was a comfortable option for the roads. The cushioning system was particularly popular because it was thick yet surprisingly comfortable. Neutral runners were also happy that it was lightweight. Inversely, there were those who felt that it was a ½ size small; others noted that the outsole wasn’t very durable. 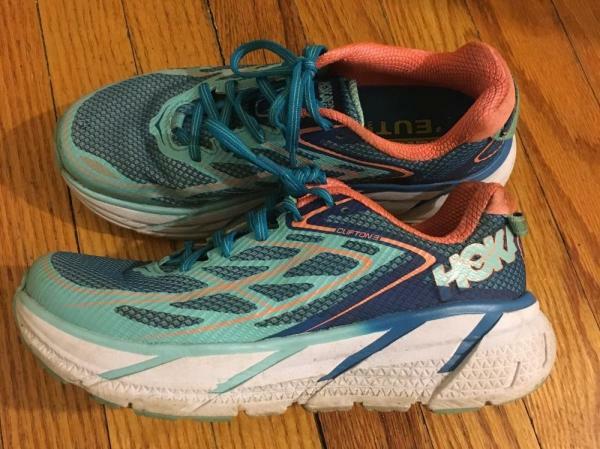 Today, I’m going to review the Hoka One One Clifton 3 which can be described simply as a lightweight, cushioned trainer that is very durable and one of my favorite running shoes I have in my arsenal. What surprised me most about the Clifton 3 is that they were fairly lightweight for the amount of cushion and material needed to make the shoe. I would assume that when most people first see these would expect to be carrying bricks on their feet. These, however, are only 8.60 ounces for a men’s size 9 (US) and 7.40 ounces for a women’s size 7 (US). This seems unexpected from a Hoka One One shoe since they look like clunkers and Hoka has some bricks in my mind. However, these are exempt from the heavyweight clunker category. The Hoka One One brand is not the most glamorous or has the best-looking shoes on the market, but are definitely worth having in the arsenal. These shoes get it done on any run you choose from long runs to tempos to fartlek or recovery runs, but let’s get back to my original point: the look of the shoe. Wearing Hokas will definitely get you some looks and the occasional time of being told or being asked why you are wearing “moon shoes” (at least that happened to me). The color options include Midnight Navy/Metallic Gold, Blue/Red Orange, and Silver/Formula One for men. For women, the color options include Medieval Blue/Spring Bud and Blue Jewel/ Neon Coral. I like them and currently have the Blue/Red Orange color combo, but that was the only option I had when I purchased them at a great sale and loved them anyway! 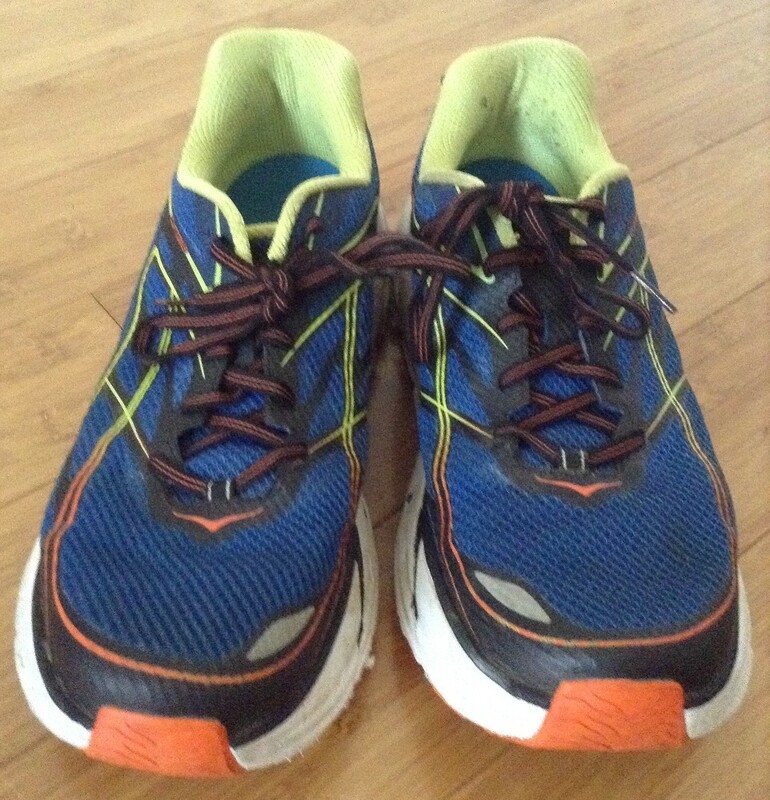 This is the first pair of the Hoka One One Clifton series that I have worn. I love the feel of them so far since they are wide enough to accommodate my wider sized feet due to the wider toe box that Hoka has implemented while allowing my feet to feel secure. The upper allows for a nice fit with an accommodating forefoot and features a seamless frame construction for supreme and lightweight comfort for anything you use these for. A continued part of the Hoka One One arsenal that has me hooked on them is that cushioned ride that they provide day in and day out due to the EVA foam midsole. The shoe’s sole also tapers up slightly up from the front to the back which allows the shoe to propel your feet forward. A few things that have truly impressed me so far about the shoe is the comfortable ride that is provided throughout the entirety of the run, no matter the distance. It feels just as cushioned on the last step as it did on the first step. Durability is always a concern with running shoes, and these seem very durable from what I have seen and experienced so far. These shoes also shocked me with the ability to do faster stuff in them. They are surprisingly responsive which I didn’t expect and allows one to do faster paces and efforts, which is nice to have in the arsenal. In conclusion, the Hoka One One Clifton 3 is a grand slam in my mind! For the overall ride, it’d be hard to find a shoe that matches the softness and smoothness of these shoes. The incredible comfort due to the high amount of cushioning while still providing a lightweight and responsive trainer are just a few of the perks of these bad boys. In the end, when cushioning and having a lightweight feel are your top priorities, look no further than these! The Hoka Clifton 3 is classified as a lightweight performance trainer. It is lightweight at 244g and has an 5mm heel-to-toe drop. The Clifton 3 uses a Lycra ComfortFrame Upper. This is an improvement from the previous version, where the Clifton 3’s upper is softer, more durable and breathable. 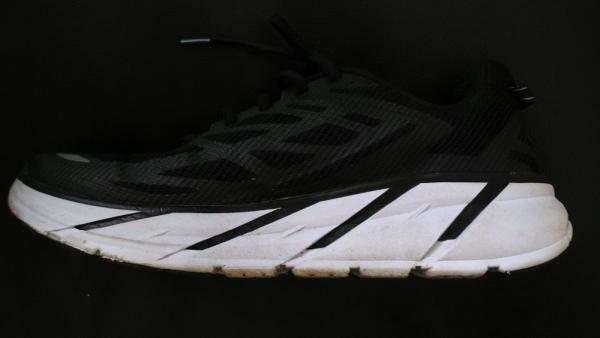 The toe box has been made slightly wider to accommodate runners with bigger feet. This allows the toes to spread out for a more natural ride. The tongue has been thinned out from the Clifton 2. This is a positive change as the tongue in the Clifton 2’s was uncomfortably thick. The tongue in the Clifton 3’s is still padded and offered a more “goldilocks” feel in comfort. The ankle collar is well-padded for additional comfort in the upper. The shoe runs true to size, but wider-footed runners are recommended to size up half a size. The midsole is made up of a full-length compression molded EVA, with stack heights of 24mm in the forefoot and 29mm in the heel. This leads to an amazing cushion-to-weight ratio, probably the best in any shoe I have ever tested. The ride felt plush without being sluggish when I picked up the pace. This is also due to the absence of outsole rubber in the middle section of the outsole, which allows the soft midsole to be in direct contact with the ground for a marshmallow ride. It also features an Early Stage Meta-Rocker Geometry. This means that the forefoot and heel are curved upwards, and allows a quicker transition from impact to toe-off. The thickness in the midsole resulted in a stiffer shoe that was difficult to flex. However, this did not compromise comfort. As for the outsole, high abrasion rubber patches are placed in the forefoot and heel for increased durability. After 240km, the rubber patches show little signs of wear. The uncovered part of the outsole wore out quicker, but this could be overlooked as lightweight shoes tend to sacrifice durability. The Clifton 3 excels on the road and is decent on the trail. It is best used for tempo workouts or long runs ranging from 10km to full marathons. The first issue I have with this shoe is that it has put on weight compared to the previous versions. It put on nearly an ounce of weight from the Clifton 2. However, the shoe is still very lightweight for the amount of cushion it offers. I found the Clifton 3 slightly narrow in the forefoot even after the widening of the toe box in this iteration of the Clifton series. Narrow-footed runners will have no issue with this but it may pose a problem for wider-footed runners such as me. It limited toe splay which resulted in my feet feeling a little constricted while running. The Hoka Clifton 3 is a lightweight trainer for runners who want a plush ride without sacrificing speed. As I began to train for my first marathon more seriously, I began looking into shoes that would be relatively light and provide great cushion/support. Previously, I had only run in Nikes, more specifically, the Vomero 11 and Flyknit Lunar 3. As soon as I typed in “best marathon shoes with support” the Hoka One One Clifton 3 came up. I was skeptical at first. The Clifton 3 was the chunkiest, weirdest shoe I’ve stumbled upon but little did I know this shoe would take me through a marathon and much more. Let’s be honest. The Clifton 3 is no competition to Nike when it comes to aesthetics. The Cliftons are extremely chunky and come in unique colorways, but I assure you, the comfort and durability of the shoe will make those other aspects irrelevant. I’ve had my Cliftons for about eight months. After a full marathon, several half marathons (including some in the pouring rain), and many long training runs, the Cliftons have held up amazingly. There has only been one tiny rip in the upper of one of the shoes, but everything else is in good condition (despite being very dirty!). The bottoms of the Clifton are in a great condition. Of course, they are not as good as new, but there are no tears. Nor did I experience any issues with rocks/debris being stuck in the bottom of the shoe, like experience with the Nike LunarEpic Flyknit 2. Additionally, the patterns on the bottom of the shoe (which also provide great traction especially for slippery roads) are obviously not that worn out like what will happen to some other running shoes after a certain period of time. Keep in mind, I usually do all my running on the road and treadmill, so using these shoes for trail running may destroy the shoe faster. All in all, it’s clear the Clifton 3 is extremely durable, making every cent worthwhile. The Clifton 3 retail for around $130, however, you can find them for a bit cheaper. On the official Hoka website, they are on sale for about $104! Running shoes usually average around the price, but for the quality of these shoes, you can’t beat the Clifton 3 in my opinion! While owning the Hoka Clifton 3, I have battled minor injuries such as hip bursitis, and the occasional soreness and aches. The Clifton 3 provide a plethora of comfort for runners. With the thick, but lightweight sole, the Cliftons help support and propel the feet. When people say running in these shoes feels like running on marshmallows, they really are not lying. The Cliftons have a very soft bounce to them. Of course, the bounce will slowly decline over time, but even after months of heavy use, they are still extremely comfortable. While wearing these shoes, I have only had blisters about three or four times. Maybe it’s the socks I wear or the Cliftons. The fact that the toe box is roomy compared to Nike running shoes makes the Cliftons not only extra comfortable but breathable as well. For those that feel one of their toes overlapping another while running, buying the Clifton 3 will be no regret. I believe the toe box has also helped my socks from not bunching up and therefore creating blisters. The tongue of the Clifton has a perfect amount of padding- not too much or too little. I have never experienced tongue discomfort while running in the Cliftons. I ultimately believe the comfort of these shoes is fantastic. Whether you are coming back from an injury, or just want to take a break from your flats, the Cliftons will be there to support you. For me, the sizing of the Clifton 3 was perfect. I ordered the same size that I wear in almost every other shoe brand, and they fit just perfect. The width is also good and comfortable. I recommend ordering the Clifton 3 true to size. The upper of the Clifton 3 is made of a soft, lightweight mesh-like material. It is extremely breathable, so running in a warm temperature is not something to worry about with the Clifton 3. I have had no problem/discomfort with the upper. Additionally, the laces on the Clifton 3 are just like any other average running sneaker. Traditional and simple laces and holes comfortably secure the foot in the Clifton. All in all, the Hoka One One Clifton 3 most definitely live up to their high standards. The light, but very cushioned shoe will provide phenomenal support for months, giving you the best bang for your buck. The Clifton 3 is one of the comfiest shoes I’ve run in and I hope Hoka One One continues to produce them. Whether you are a new runner or seasoned marathoner, the Clifton 3 will not disappoint you through whatever you want - 5Ks, tempo runs and marathons. It's still light for how much cushioning you get. It goes through the stride well. This is one of the shoes wherein if you're feeling beat up, if you're feeling tired from your miles and you want something a little easier on the legs, I think this is a great shoe. The Hoka One One Clifton 3 uses high-quality materials in order to provide a reliable running experience for runners. A seamless upper design allows the wearer to remain free from skin irritation brought by traditional seams and stitched-on sections. An open construction allows the foot to experience air circulation, thus letting the runner use the shoe for long periods of time without succumbing to sweat and that stifling feeling when wearing shoes. The mid-sole unit utilizes a full-length foam unit that looks thick on the outside. Made from Compression Molded Ethylene vinyl acetate, this foam is able to deliver sure cushioning and support to the foot without breaking down easily. Its thickness brings in the trademark look of the Hoka One One brand, while also ensuring a comfortable underfoot experience that lasts long. The external sole unit is in full contact with the ground. This design ensures a smoother transition from the heel to the toe when running. It also maximizes the traction capabilities of the outsole. A lightweight layer of rubber is used in the outsole. It’s highly resistant to wear and tear, so runners are able to trust it to remain efficient even after many uses. The Hoka One One Clifton 3 uses regular measurements for length. Men and women are able to enjoy a more relaxed fit when they try out this shoe before purchasing it. The available width is medium, thus enabling it to accommodate those with medium sized feet. Its semi-curved shape mimics the natural curve of the human foot. A lightweight rubber material is used for the outsole unit of the Hoka One One Clifton 3. It is highly resistant to abrasion, so it is capable of shielding the rest of the sole unit from wear and tear with ease. The Full Ground Contact design of the outsole maximizes its surface area so that the rubber material would be able to work more efficiently in delivering traction. It also assists the foot in achieving a smoother and more natural transition through the gait cycle. The Compression Molded Ethylene vinyl acetate foam or CMEVA is used for the entire length of the Hoka One One Clifton 3’s platform. It’s a durable material that delivers sure cushioning that’s responsive and springy. Its thickness brings reliable impact protection and long-lasting performance. The Early Stage Meta-Rocker Geometry is a rocker design that’s made to assist the foot in achieving a faster and more effective performance. It is likened to the actual mechanics of the foot when taking each step, rocking from the heel to the toe in a single, fluid motion. This feature is also present in the Clifton 5, one of the more recent iterations of the series. The Air Mesh is a material that has an open construction. Visible pores in the fabric act as portals for air to easily enter the shoe in order to maintain a cool and dry environment for the wearer’s foot. The Structural Overlays aren’t stitched onto the fabric of the Clifton 3. They’re fused directly to the mesh, thus reducing its weight and preventing stiffness in the upper. A No-Sew Construction allows the runner to feel comfortable when wearing the shoe without socks. It reduces the risk of blistering and skin irritation.